When Annie heard what day it was, she hid under the table. 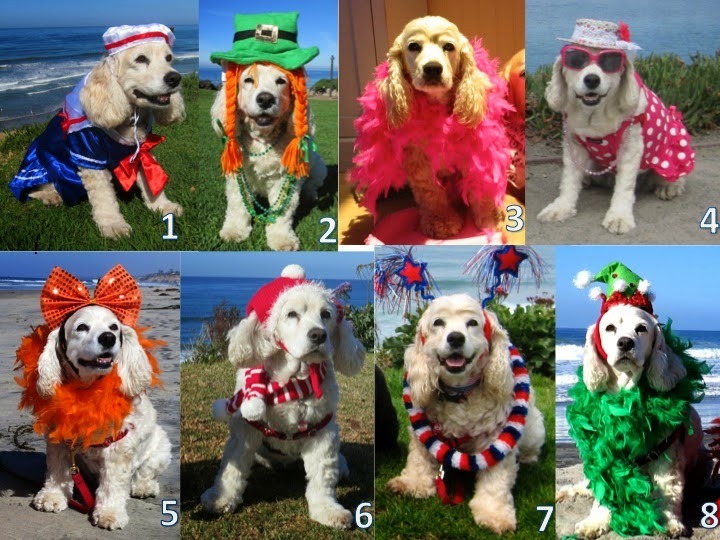 I didn't want to upset her, so I suggested we just go through pictures of some fave dress ups of her . I just adore the way she looks in a boa and she really wears hats so well. (Too bad she refuses tiaras). Looking at these pics really makes me want to dress her up today, after all she is my pet! Which look do you think she should wear? Annie has the best wardrobe....next to you, Rosy! I like #4 and #5, but since I am also orange, I'll have to pick the orange! I'm with Annie, I'd hide under the table too rather than have to get dressed up. Well, from a boy dog perspective, I like you without any clothes on, with only your beautiful white fur .... sitting on a bed of green grass overlooking the ocean, with me crooning you with my hooowwwls of love.